Travel back in time at the age of the dinosaurs with SM Family Day’s featured movie “Dino Time” that will play on select weekends of November 19, 20, 26 and 27 at all SM theatres nationwide. 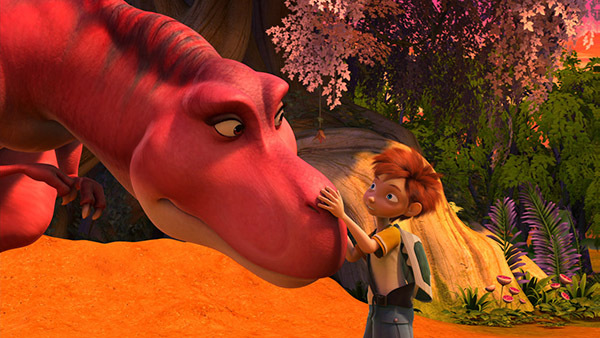 In the movie “Dino Time,” a young adventurous boy named Ernie needs an escape. His mom, Sue, is a strict disciplinarian, his little sister, Julia, tattles on him every chance she gets, and he just can’t seem to stay out of trouble. When Ernie and his best friend Max slip past security to check out the Dinosaur Museum’s top-secret fossil exhibit, Julia sets off the burglar alarm. A group of bumbling guards recklessly pursue the panicked boys, who are finally caught after Ernie’s rocketboard launches them head-first into a priceless set of dinosaur fossils. Ernie is swiftly grounded, but he sneaks away to the house next door, where Max, with the help of his genius father, has invented a sleek, egg-shaped contraption that he believes—despite countless failed experiments—can travel through time. Suddenly, Julia bursts in to bust the two boys again, and in the ensuing chaos, the time machine whirs to life and closes its doors on the three arguing kids. After a violent jolt, the hydraulic doors hiss open to reveal a gorgeous green valley. A shadow passes overhead, and the kids look up to see the bewildered face of a living, breathing Tyrannosaurus Rex. The huge dinosaur nuzzles them softly, and Ernie realizes that they’re not food-they’re family. The egg-shaped time machine has landed in its nest, and the dinosaur thinks the human children are hers. “Dino Time” is an SM Family Movie Day feature from CrystalSky Multimedia that encourages relaxing family bonding at the movies. Simply purchase two tickets for “Dino Time” and two of your children will be free to watch the movie. The SM Family Movie campaign also offers fun activities with various discounts and free coupons from the mall’s partner merchants. “Dino Time” is from CrystalSky Multimedia - follow CrystalSky Multimedia on Facebook and on Twitter for more updates on SM’s Family Movie Day.